In an article on Jill Lepore in the Winter 2014 issue of Radcliffe Magazine, there is mention of the compelling essay in The New Yorker on writing about Ben Franklin’s sister. Lepore speaks of her mother building a doll’s house for her out of cardboard shoe boxes, papering each wall, affixing tiny stringed lights. Right then, I remembered my mother’s wings. 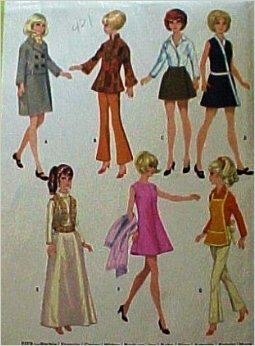 My mother made a lot of things for me growing up, including making tiny Barbie clothes; there was a wrap dress in blue zebra print I remember–were they from Butterick patterns? She made covers for our sofa and chairs, made cushions and drapes. I would make trips with her to JoAnne’s Fabrics, and while my mother dreamed about the fabrics, I would wait impatiently for her, paging through the catalogues of dress illustrations. Although a pile of felt squares housed in a corner cart fascinated me, I was not really interested in fabric. Unlike my mother, I could not sew. When I was eight and watched The Banana Splits, a 1960’s version of Barney Gone Mad, my mother made me my very own Snorky elephant, a toy sewn from a pre-printed pattern. I loved it. My father made me boats with out of paper for me, four of them connected together, or one which had foldout canopied seats, beautiful origami that made me long to travel.In a few years, when I took Home Ec, as required by my school, I tried to feed cloth gently to the machine’s needle but I always got it jammed. I wasn’t good at cutting fabric, I did not understand how to purl and knit, and out of desperation, perhaps, my mother got me to crewel, an easier form of embroidery, using yarn instead of thread. But what I remembered when I read the Jill Lepore article were the wings my mother made for a Halloween costume. They were a surprise for me. Usually I was a witch for Halloween, easy enough with my long black hair, which my mother let me wear unbraided. But had I been a fairy one year? She fashioned cardboard wings for me, and decorated them with the bright blue and white stars foil wrappers from Drake’s Yodels. Every lunch, I would carry a cheese or Peanut Butter sandwich, a bag of Fritos, a packaged dessert, carrot sticks, and an apple. The carrot sticks would drip to the corner of the plastic bag. Did she save the wrappers and send me to school with naked Yodels? Did she ask me to bring them home? I can call her and find out. Part of the charm in writing is remembering, challenging your mind to retrieve half-forgotten details. Remembering the story can furnish the details, which is the opposite of fiction in some ways. I can only remember the wings. I cannot remember the costume or the person who might have wanted to be a fairy instead of a witch or a gypsy, two costumes I do remember. In calling my mother, she wonders if someone else might have made the wings, and reasons maybe she bought me a packaged costume. I don’t remember the costume, I tell her, but I remember the wings, the way the wings were edged in the starred foil, and how there were stripes made with foil on the inside because, obviously, we couldn’t eat that many Yodels. She wonders if I am thinking of someone else. We both remember me always wanting to be a witch. She said she made a cape, but had to buy the hat because she could not make one. I don’t remember the hat.